Section 12. "Be it further ordained, That whoever shall exercise the dangerous practice of coursing or coasting upon sleds in any of the streets, or upon any of the sidewalks in the this city, shall forfeit and pay for each offence a sum not less than one dollar, and not more than twenty dollars, to be paid by each offender respectively." Link: Boston 1775: Colonial Boston Vocabulary: "coasting". 26 June 1845 A son of Mr. Abner Forbes had mixed a pound of powder, charcoal, and saltpetre in a pan, for making fireworks for the coming 4th of July--which his mother finding, supposed to be charcoal, threw into the fire, causing an explosion that came near costing her life. She was shockingly burned. Sec. 2. Be it further ordained, That no person or persons shall discharge or set off, any squibs, serpents, rockets, or other fire works, or make any bonfire, or other fire, in any of the streets, squares, commons, lanes, or alleys, or upon or from any house or building, or on any wharf, within the city, without leave first had and obtained therefor from the Mayor and Aldermen, under a penalty for every such offence, of a sum not less than one dollar, nor more than twenty dollars. The Boston Globe reports today that Newbury Street was recently subject to a crackdown on business advertising signs standing on the sidewalks. The article notes that such signs "have been illegal for decades". In fact, they've been illegal for much longer than that. Keeping sidewalks free of encumbrances has always been important to Bostonians. Section 15. Be it further ordained, That if any person shall place or cause to be placed, any trunk, bale, box, crate, cask, or any package, article or thing whatsover, on or over any part of any public street, lane, court, or alley in this city, except as is provided in the last preceding section, whether the same shall be exposed for sale there, or otherwise, and shall suffer the same to remain more than three hours after it is first placed there, or more than ten minutes after notice to remove the same, given by the Mayor, or some other person by him authorized, the person or persons so offending, shall forfeit and pay the sum of two dollars for every such offence." Link: Boston's sign police conduct a sweep - The Boston Globe. To follow up on my Boston/Roxbury boundary posts (here and here) I'm posting the law regarding the boundary between Roxbury and Boston found in the The Charter and Ordinances of the City of Boston... published in 1834. A description of the Boston/Brookline boundary can be found here. Extract from the Records of the Selectmen of the Town of Boston--May 20, 1788. 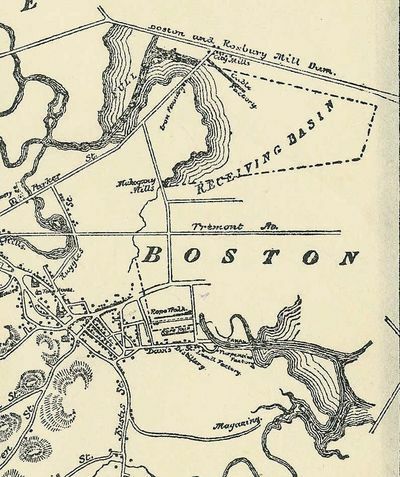 The following boundary line between Boston and Roxbury was agreed upon by the Selectment of both Towns, and the agreement accepted by the Selectmen of Boston. "To wit." 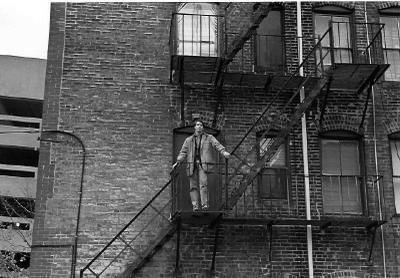 Beginning at the mouth of the creek which opens into the bay leading to Cambridge, and as the creek runs until it comes in a range with the fence and trees btween the land now occupied by the widow Susan Davis, formerly John Richardson, Esquire's, and the land now belonging to the heirs of Samuel Wells, Esq. deceased, formerly Mr. Minot's, then across the street or highway, until it comes to a large stone standing end-ways in the fence on the easterly side of said street or highway, and from thence south forty-three degrees east to a large stone standing end-ways in the ground about eighty feet from the said street or highway, marked B. on the easterly side, and R. on the westerly side, and from thence the same course to large stone standing in the meadow, marked B. on the northwesterly side, and R. on the southeasterly side; from thence turning and running north fifty-eight degrees, east by a straight line until it comes to a stone affixed in Lambs Dam, (so called) and from thence to the creek, and as said creek runs into the bay between the towns of Boston and Dorchester. My 1838 Boston Almanac notes that on this date in 1836, the Warren Bridge was declared free. This brief entry makes no mention of the protracted legal battle over the bridge that ultimately reached the Supreme Court of the United States, perhaps because almost every Bostonian of the time would have known the story of the Warren Bridge. In my post yesterday on water and WiFi, I noted that private companies undertook many of the internal improvement projects in late 18th and early 19th century Boston. Bridges were no exception. The legislation authorizing the Charles River Bridge (constructed in 1785) gave the proprietors the right to collect tolls for forty years, after which the ownership of the bridge would pass to the Commonwealth. In 1792 the forty-year term was extended to seventy years. The bridge, which connected Charlestown and Boston, opened in 1786 and proved wildly successful but insufficient to serve the growing population of Boston as the years went on. John Hales commented on the problem in 1821: “The principal leading streets from these avenues [the Mill Dam, the road to Roxbury, and the West Boston Bridge] are generally of a good width, except that from the Charlestown Bridge, which is irregular and too contracted for carriages, and in fact the whole northern section of the town stands in need of some general system of modernization.” To alleviate some of these traffic problems, the General Court authorized another bridge, the Warren Bridge, in 1828. In my post on Washington Street, I speculated that Washington Street may have had different names for different stretches of the street because house numbering was not widely used in the 18th century. Here is the ordinance regulating house numbering, which came into effect after Boston became a city. Section 2. Be it further ordained, That the Mayor and Aldermen shall have power, (provided it can be done without expense to the city) to cause numbers of regular series, to be affixed to or indscribed on, all dwelling houses and other buildings erected or fronting on any street, lane, alley, or public court within the city of Boston, at their discretion; and shall also have power to determine the form, size, and material of such numbers, and the mode, place, succession and order, of inscribing or affixing them on their respective houses or other buildings. Apparently cleanliness wasn't next to godliness for beasts of burden in the City of Boston. Sec. 2. Be it futher ordained, That no person whatsoever shall sit or stand, in or upon any carriage, or on any beast harnessed thereto with intent to drive the same, unless he shall have strong reins, or lines fastened to the bridle of said beast, and held in his hands, sufficient to guide and restrain such beast from running, galloping, or going at immoderate rates throught the streets, lanes and alleys of the city; and no person whatsoever, driving any such carriage, or riding upon any beast, in or through the streets, lanes or alleys aforesaid, shall suffer the said beast to go in a gallop or other immoderate gait. Sec. 18. Be it futher ordained, That no person shall unreasonably or cruelly beat or otherwise use or abuse any horse or other beast, under his care, within the City of Boston; and no person shall be permitted, or allowed to lead, drive or ride, any horse, or other beast of burden to any pond, or to any part of the sea, or to any other public place, to be washed up on the Lord's Day. And no person shall turn any other beast of burden loose within the City of Boston, or voluntarily permit or suffer the same to go at large therein. Sec. 19. Be it futher ordained, That whoever shall offend against any provision of the aforegoing section, or either of them, shall forfeit and pay for each offence a sum not less than one dollar nor more than twenty dollars, to be recovered by complaint before the Justices of the Police Court. Bostonians had special reason to be wary of snowballs--a crowd throwing snowballs at English soldiers had helped trigger the Boston Massacre. From The Charter and Ordinances of the City of Boston together with the Acts of the Legislature Relating to the City, Boston, 1834. Section 10 Be it further ordained, That whosoever hereafter shall, at any time, play at foot ball; or whoever shall be guilty of throwing stones or snow-balls, within any of the streets, squares, lanes, or alleys of this city, shall forfeit and pay, for each offence, a sum not less than fifty cents, and not more than two dollars, to be paid by each offender respectively.